Diane Tirado wrote a goodbye message to her eighth graders on a white board saying, "Bye Kids, Mrs. Tirado loves you and wishes you the best in life! I have been fired for refusing to give you a 50% for not handing anything in. 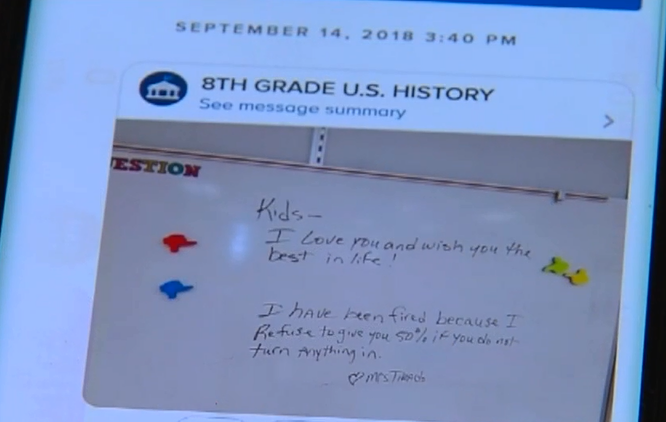 &lt;3 Mrs. Tirado"
PORT ST. LUCIE, Fla. (AP) — A Florida history teacher says she was fired for refusing to give half-credit to students who didn’t turn in their assignments. She wrote a goodbye message to her eighth graders on a whiteboard saying, "Bye Kids, Mrs. Tirado loves you and wishes you the best in life! I have been fired for refusing to give you a 50% for not handing anything in. 💓 Mrs. Tirado." Diane Tirado says her school along Florida’s Treasure Coast had a “no zero” policy, requiring teachers to give students no less than a 50-percent grade on assignments. Tirado tells television station WPTV that she was fired in mid-September when she refused to follow the policy after several students didn’t turn in a homework project. No specific cause was given in her termination letter from the principal at West Gate school, since Tirado was still on probation having been recently hired. The principal deferred comment to the school district. 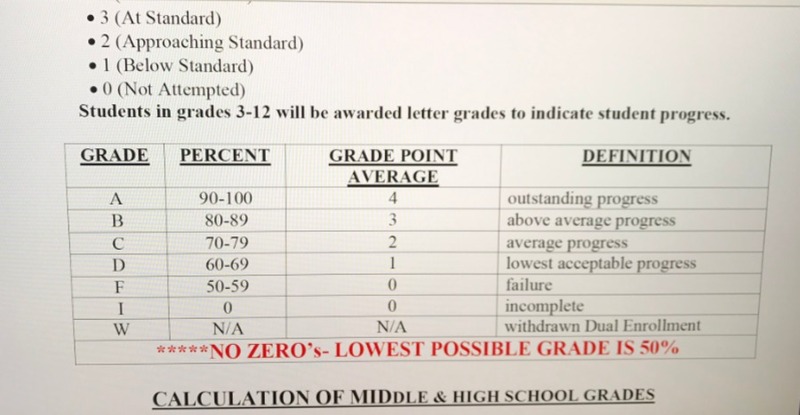 A spokeswoman for St. Lucie Public Schools says there is no district policy prohibiting teachers from giving a grade of zero. A zero is noted on the scale for work not attempted or work that is incomplete."